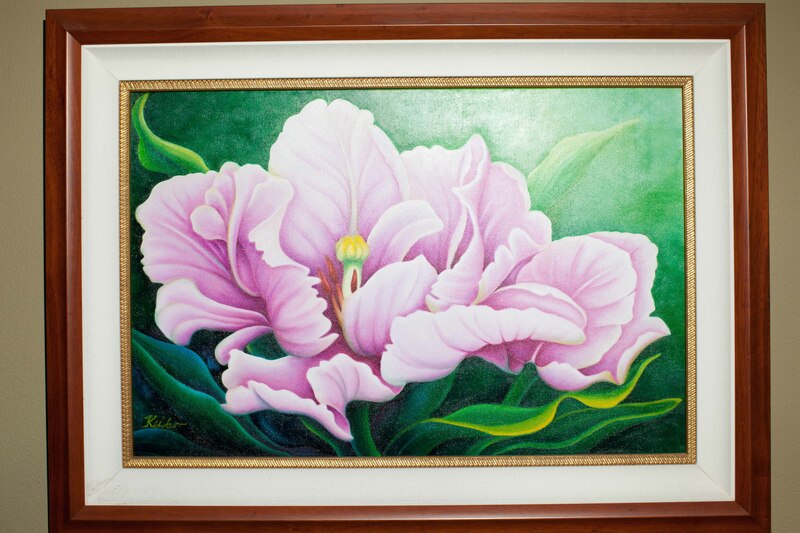 She painted this one as a gift to commemorate me and David’s 25th wedding anniversary. 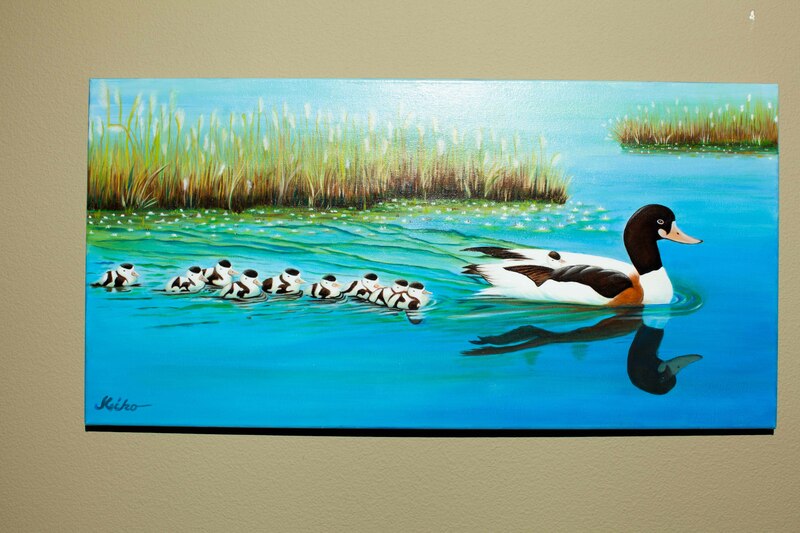 This one was a special painting she did for my daughter Megumi. 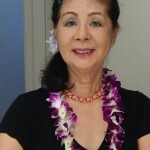 Keiko Nishiguchi began painting at age 72 upon meeting a master painter in Honolulu. 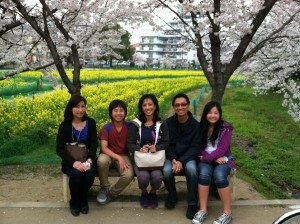 She is a mother to three daughters and a grandmother to two. She resides in Honolulu with her husband Harry in a condo building which was once used for a shoot for the hit TV show, LOST. They enjoy daily walks in Waikiki. I was deep in thought one day when my kids were very young. I think Josh was barely 3 and Meg was still a baby. I was worrying and fretting over a conversation I had with someone which went really, really poorly. I was being honest and truthful, but the other person reacted in a way which was unexpected. She got really mad at me. The thought of someone really important being angry at me about something I said weighed heavily on my heart. I kept replaying our conversation over and over, wishing for a different outcome. I also continued to rehearse what I should have said and what I will say the next time I had an encounter with her. I knew I was right about my convictions about the matter — which, today more than a decade later, I cannot clearly recall what — but still, I was fearful. Fearful of letting somebody down. Fearful of having someone upset with me. Josh must have sensed that something was amiss. I was not my usual cheerful self…or at least as cheerful as I usually try to be with only a few hours of sleep a night. Maybe that’s the reason why this little tiff had turned into a major relational nightmare in my foggy, sleep-deprived mind. As I mindlessly folded the laundry on my bed, Josh crawled up to join me. He was never a really talkative child. Even today, as a teenager, he still tends to be a young man of a few words. He sat and watched me sigh between each piece of clothing that I folded. He handed me mismatched socks to pair up. Josh had always been a sensitive and sympathetic child. When he was in the church nursery and another baby was crying, he would always crawl over and try to console, usually by patting its back. Someone’s pain becomes his own. He is still a good listener, and he says that he wants to become a clinical psychologist or a therapist someday. He can read people using his senses…his sixth sense, mostly. I put the pile of laundry aside and sat down on the bed. I wanted to get comfortable so I could really focus on rehashing the incident yet again. And again. You know, it takes a lot of energy to continue picking on your emotional scabs! How did he know this? And how did he know that I needed to hear that statement at that very moment? Did I ever tell him that there is nothing to fear? I couldn’t recall if I had ever said those words to him myself, but somehow he knew in his heart that those were the words Mommy needed right there and then. 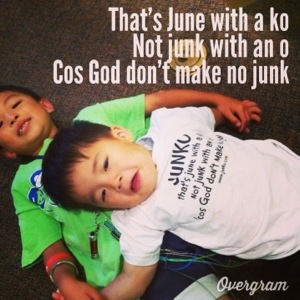 I knew right away that God was speaking to me through the mouth of my own babe, my toddler son Josh. It was indeed exactly what I needed to hear, for I was starting to fear the failure of this relationship more than anything in life. I was reminded that there truly is nothing to fear in this world, certainly not if God is with me. From that moment on, my fear of disappointing a person began to slowly melt away. In fact, it took several months and a lot of work to repair, but this relationship has been restored and has gotten even better now than ever. It was also the beginning of my journey to tackle my people-pleasing nature which had dragged me down for far too long. I also began to lean on God for his strength and to trust Him in all areas of my life. Instead of wasting my emotional energy fretting and worrying, I learned to relinquish everything to the Lord in prayer. And it only took a toddler’s sweet words to teach me that lesson. Has God ever spoken to you through your children? Tell me about it in the comments below! Our kids’ neighborhood K-8 public school happens to be on the year-round schedule, which means that though we only get five weeks off for summer break, we are treated with 3-week breaks spaced evenly throughout the year in the fall, winter, and spring. Although the school year starts at the end of July (yes, that part is cruel), we finish with the other schools in our district the following June. We have absolutely loved the year-round schedule. Just when our kids have had enough with classes and homework, we get a few weeks off to refresh our minds. And just when we parents are starting to go bonkers with our children being home all day, they go back to school. Teachers say that their students retain more when they return for the new school year. The teachers all love the year-round schedule as much as we do. We particularly enjoy our fall breaks. The weather is milder, the crowds thinner, and airfare cheaper than during the summer. Many of our school families take their big trips to exotic places during the fall. 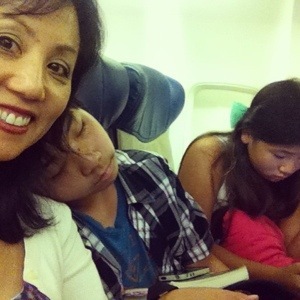 We take off to Hawaii every fall to go see their grandparents. It alleviates the heartache we feel returning to school when other students are still enjoying their summer. After all, while most families are going to back-to-school night, we are boarding a plane to paradise! But, alas, no good thing lasts forever. When Josh finished 8th grade, it was over. No more year-round schedule in high school. Due to sports and other inter-scholastic activities, all high schools in our area are on the traditional school calendar — long, hot summers and virtually no breaks all year except for a few days here and there. Even worse, I would have our kids on two different schedules! It pretty much meant that we were not going to be going anywhere for two years until Meg graduated middle school. Oh, the sadness! That’s when I took my friend Heather’s advice: enjoy spending time with one child at a time. 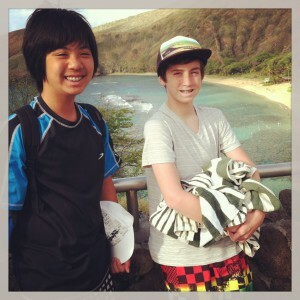 This August, after Meg already went back to school, I took Josh and his friend Sam to Honolulu for a week. Yes, it was very hot, crowded, and expensive, but we had a wonderful time. It was fun getting reacquainted with my teenage son while enjoying activities together such as snorkeling, swimming, and just hanging out. 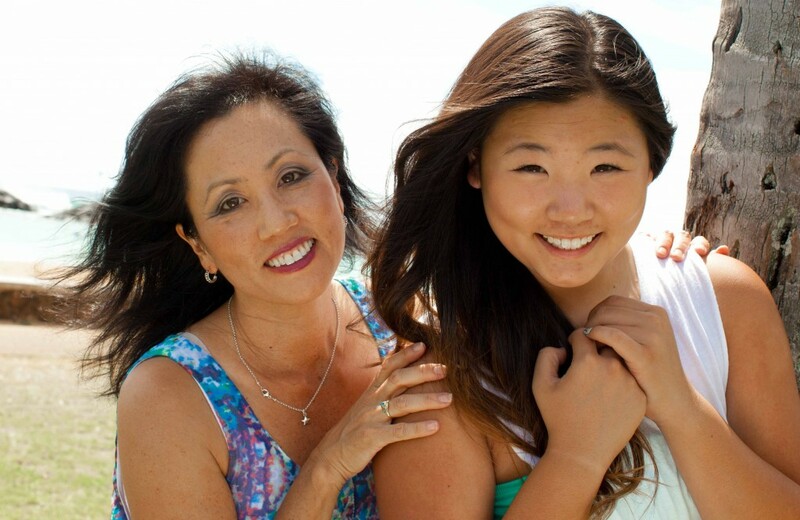 Then this fall, I went back again to Hawaii for a mother-daughter time with Meg. Her activity of choice was shopping, of which we did plenty in Waikiki. The more time I spent with this girl, the more I enjoyed her. We ate a lot of good foods together and spent much time with my parents and my sisters, her aunties, who also flew into Hawaii to be with us. Between these two trips, my parents were also able to have individual times with each of their grandkids, which was a blessing. Navigating the rough seas of various school calendars and breaks have taught me that, once again, parenting has a lot of unexpected surprises that could turn out better than even before. Don’t get me wrong — we have absolutely loved year-round schedule and wish high schools had them, too, but we somehow figured out how to work with two overlapping schedules. We are going to be entering uncharted waters once again when both of them are in high school next year, but I have a feeling that it is all going to be okay. After all, in only a few more years, they are both going to be out of the house. That is going to be so sad…but maybe unexpectedly good, too! Does anyone else like the year-round schedule? Tell me what to expect when our family enters traditional schedule. What do you do with your long summers? Josh decided to get fancy on the presentation. 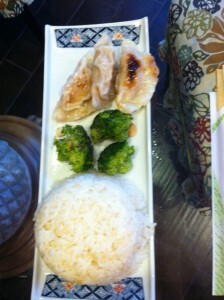 Saturdays were gyoza making days at my parents’ take-out restaurant, Red Hill Japanese Deli in Tustin, California. My dad worked the cash register up front, my mom ran the kitchen, and my two sisters and I were the sou chefs. My mom would thaw industrial-sized package of wonton wraps — circular, not squares — and several pounds of ground pork overnight on Fridays so that we could sit around a counter in the kitchen to make several hundred little dumplings after our Saturday morning Japanese school. Often, my mom would forget to start the thawing until too late, resulting in us nearly freezing our little fingers while mixing the ingredients by hand. If the wraps weren’t thawed, they would stick together and tear when we would try to pry them apart, so we would dunk the whole sealed package in warm water before we could begin the work. We had no microwave ovens in our kitchen back then. 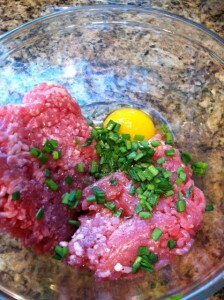 Mother would place the thawed (or nearly so) ground pork in a big bowl, then crack a few eggs on top. 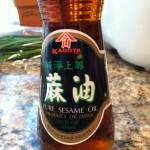 She would add chopped nira Japanese chives, salt, pepper, and a dash of sesame oil. Nothing was measured, as our master chef cooked strictly by instinct. You couldn’t exactly taste test raw pork either, so we never knew exactly how the gyozas would taste until they were all cooked. By golly, they always tasted perfect. Never the same each week, mind you, but always delicious. We would each place a thawed (or nearly so) wrap in our left hand, spoon out a small amount of the pork mixture with our right, then we’d wet the outer edge of the wrap in order to create an adhesive seal when we folded them closed. But just pressing the edges together to make a half-moon shape was too boring; we each added a signature crimp on the top flap to add our own flair. No two gyozas were alike. We were not machines. 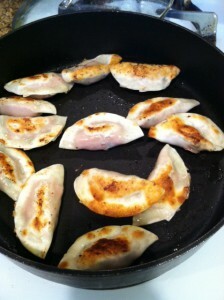 So, here is my recipe for a more normal amount of gyozas for a family of four. I’m a little iffy on the exact amounts for each ingredient, so you might have to try this a few times before landing on your favorite mix. I hope you add your own flair, too! 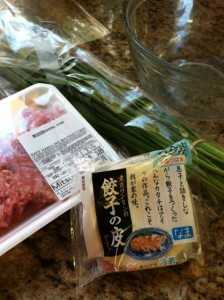 Combine pork, egg, salt, pepper, sesame oil, and nira in a bowl. Mix by hand, squeezing the mixture through your fingers again and again until thoroughly mixed. Take one wrap and place about 1/2 teaspoonful of the meat mixture in the center (not too much or they’ll ooze out when closing). Dip your finger in the bowl of water, and follow the circular outer edge of the wonton. Close the wonton by folding it in half, although you might gather the top layer 3~4 times to add crimping (see photo above). 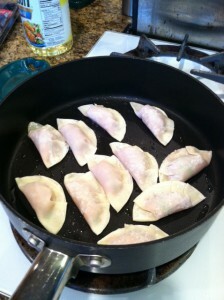 Heat the vegetable oil in a frying pan on medium high, then place about 10 gyozas at a time, crimped side up. When the bottom is browned in a few minutes, flip them over to sear the other side for about one minute. Add 1/2 cup water in the pan, then cover. Let it steam for about 2 minutes or until the water evaporates and the pork is cooked thoroughly. Serve with or without sauce. I like to make my own: 1/4 cup soy sauce, 1/4 cup rice vinegar, and 1/2 teaspoon sesame oil (or chili sesame oil if you want a little kick). Measurement approximate! You could also boil these dumplings in water and drop them into your favorite noodle dish. Tip: You might make just a few dumplings to start, cook them, then taste before committing the entire batch without adjusting the seasoning. I hope you like them! I come from a culture where the word no is a bit of a taboo. It’s not that we don’t have the word no in Japanese. It is iie (pronounced ee-ee-yeh). The trouble is, we don’t often come right out and say it. Our culture is really big on saving face, both our own and that of the other party, so to just say no without much padding around it is not very cool. So, we Japanese have perfected the art of beating around the bush. Both parties are adept at reading between the lines, so they dance in unison around the truth until they both get the clue. Yeah, it’s like speaking code half the time. For the people within the Japanese society, however, this is normal and everyone totally gets each other. Often, one caves and ends up saying yes out of obligation, but at least no one loses face. Imagine our shock, then, when my family emigrated here when I was a child. Americans are so direct! From our perspective, our new neighbors seemed completely rude and cruel for being so straightforward. It took quite a while to stop feeling personally wounded by every direct answer. In time, though, I began to appreciate the honesty of this culture. It was rather freeing not having to read between the lines and guessing what people were truly saying. We actually saw the value in coming right out and saying yes or no, thereby extinguishing false hopes and expectations. I realize I am generalizing here, as I have since met indirect speakers in the US as well as blunt people in Japan. But in any culture, I see a keen need to balance honesty with kindness — “Speaking the truth in love,” as it says in Ephesians 4:15. Having grown up in both cultures, I now prefer hearing straight answers over indirect ones, and I certainly prefer it over lies. More often than not, though, I still have trouble speaking directly, which drives my husband up the wall. “You’re being cryptic again. Just tell me what you want,” he tells me in frustration. I also still end up doing something out of obligation occasionally because I just could not say no, but I’m making progress. It’s still important to be considerate of others, but not at the expense of my own sanity. The best way for them to learn to do this is at home. In order to accomplish this, therefore, I have to resist busting through their no‘s. I can allow them to not like my new recipe, return outfits I bought for them on my own if they don’t like it, and, someday when they’re grown adults, to let them choose to go on a trip with their friends instead or coming home for the Holidays. Of course, we wouldn’t allow “No, I don’t want to go to bed!” when they’re 5 years old, but you get the idea — incremental no‘s at age appropriate steps. I have learned a great deal on this topic through an insightful book called Boundaries by Henry Cloud and John Townsend. I highly recommend it for everyone but especially for parents. After all, we have to be healthy to raise healthy kids. I don’t know about you, but becoming a parent has forced me to grow up. Hasn’t it, for you? I hung out with some of my biggest fans. I gathered a few other moms for some late night workouts! We spent quality time with some friends. 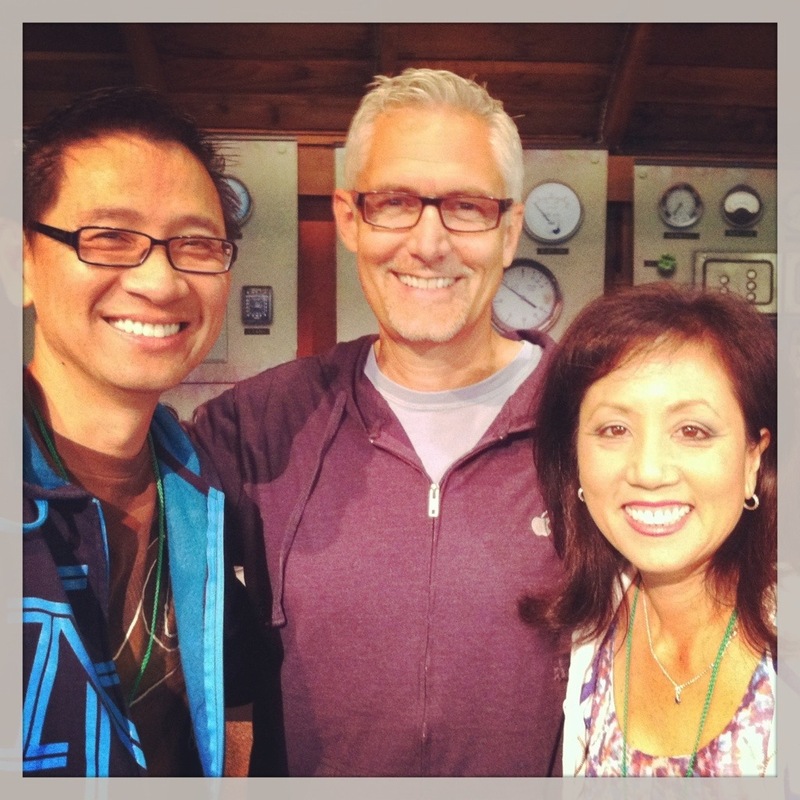 …And learned great lessons about God from wonderful speakers like Pastor Rene Schlaepfer of Twin Lakes Church in Aptos, CA. 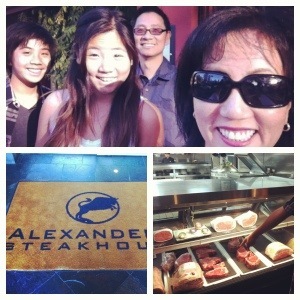 After the week, we had our traditional dinner out at Alexander’s Steakhouse in Cupertino, CA. Here’s one of the best parts — we FLEW home instead of driving 8 hours this year! 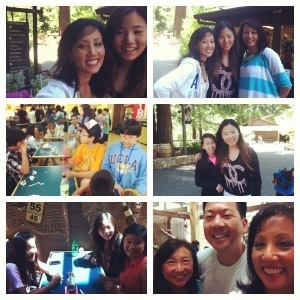 Our family just returned from a week-long camp at Mount Hermon Christian Conference Center in Northern California. This is our 11th year of what has become our family tradition. When we arrived at Mt. Hermon for the very first time, our kids were only ages 4 and almost 2. 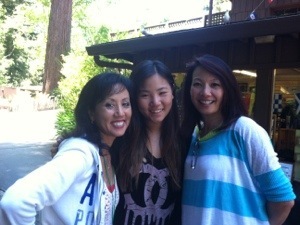 We were all at Main Camp together in one cabin, sharing two beds amongst the four of us. We ate every meal together and played ping pong until late at night. 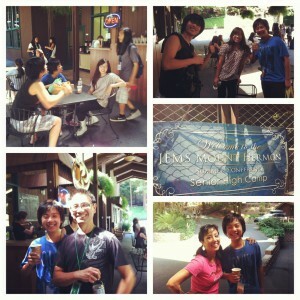 We swam at the pool and hung out at the Fountain for ice cream and snacks with new friends. Except for the times when the kids went off to their own camp programs, we were constantly together and built memories as a family. As the years went by and our kids grew, it became increasingly uncomfortable to share beds, even if they were queen-size. They became a little more independent, roaming the camp ground with their friends like pack animals and hanging out at the Fountain until the wee hours. They found other friends to sit with at meals and even had a sleepover or two at friends’ cabins, all within the safe confines of Mt. 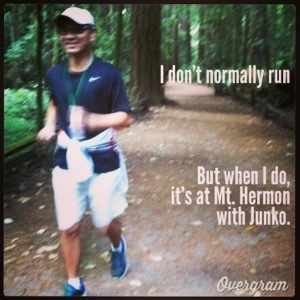 Hermon. Then, a few years ago, the day finally came when Josh had to go to a separate campground for junior high campers. Though it was only a few miles away, he was going to be on his own for an entire week for the first time. Like it or not, he had to adjust to sleeping in his own bunk in a cabin with seven other boys and a counselor. He was not looking forward to it. On the appointed visitation day, we arrived to find our junior higher standing at the end of the parking lot craning his neck, eagerly awaiting the arrival of his parents who were 30 minutes late. After a long hug, he showed us his cabin, introduced us to his counselor, and gave us a tour of his camp, dusty and small compared to Main Camp. He said he was having fun but we could tell he was holding back tears. If it wasn’t for the counselor who invited him to go play a game, Josh would probably have hopped in our trunk to escape back to our cabin. Fortunately, he sounded much more upbeat when we picked him up on Saturday. “Meg, you are going to love junior high camp,” he declared to his sister who was enjoying being an only child that week at Main Camp, a luxury afforded only to our firstborn for the first two years of his life. 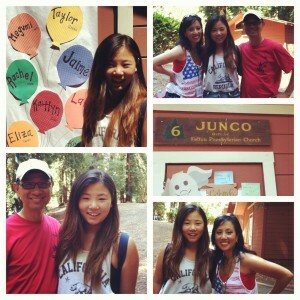 Meg having a great time at inter-high camp. What caught us off guard, however, was how lost David and I were going to feel when we first became kid-less. We wondered around Main Camp the first couple of days in a daze. Before long, however, we got quite used to being just the two of us again and was almost sad that the week was ending. And we will continue repeating this tradition for at least a few more years. Both kids love their youth camps so much that visitations are now very brief. “Hi mom and dad! Thanks for coming. Well, bye!” is about the extent of it. We’re glad. We learn a lot about God while we are at Mt. 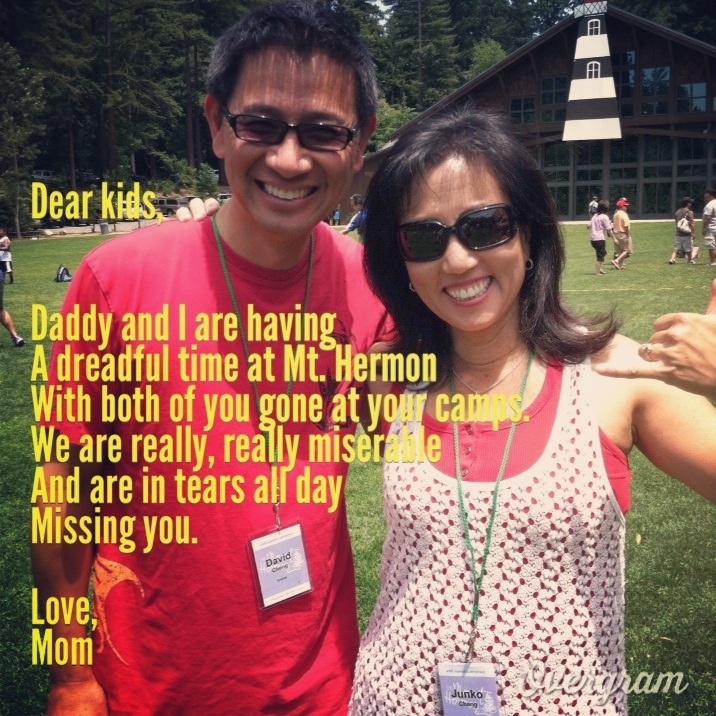 Hermon, but most of all it has been a great lesson in parenting. We hold them close, then we gradually let go with each passing year and watch our own children build faiths of their own. Within the safe haven of Mt. Hermon, surrounded by other parents leading the way or walking alongside us, David and I have learned to grow as parents. What are your summer family traditions? Tell me here or I’ll see you at the Fountain! 1. Your body will recover, but it will never be the same again. Enjoy those new curves. 2. You can’t erase stretchmarks, so wear them with pride as a badge of honor. 3. One-piece bathing suits are very stylish these days if #2 doesn’t work for you. 4. Baby blues are real. Pay attention to them and seek help if you feel like murdering your husband and your mother and burning down the house. 5. There will be days when you will be disheveled and can’t even find the time to take a shower. Try to go no more than three days without one, however. 6. When your baby is turning your life upside down and you can’t understand why anyone would want to congratulate you for being such a mess, just smile and thank them. You will eventually come around. 7. Plan on not going out to eat at a restaurant for about three years. 8. Go ahead and accept help, especially meals. You spent many years bringing meals to others, so it’s finally your turn. 9. Nursing problems and mastitis are signs of overdoing it. Remember, you are not going to be as capable as you have been all your life because now there’s a precious little one to take care of. Kick your feet up and relax. 10. Speaking of nursing, you won’t be wearing a one piece dress for a while. For that matter, no dry clean-only clothes for a few years either. 11. Don’t save baby shower gift outfits for a rainy day, because babies can fit into them for only a few hours before they outgrow them. Put them on as soon as they fit and enjoy the cuteness while you can. 12. Join a moms’ group such as MOPS. Meet up with other moms in your same shoes and you won’t feel so alone. 13. Speaking of shoes, go out and get lots of pairs of slip-ons. Your time will be so pressed that you won’t have time to tie up your laces or buckle your shoes. 16. You will get tired of hearing this, but in time you will come to appreciate these words: They grow up so quickly. Corollary 16a: Take lots of pictures. 17. Avoid driving when sleep deprived. 18. Try not to rock while standing and talking to someone without an actual baby in your arms. I know — all moms do this. 19. It’s going to feel really weird the first time you fill out a form for your child. On the box where it says, “Parent,” you’re supposed to put your own name in it, not your mom’s. 20. Praise God for the miracle of life, and thank Him for the privilege of being able to take part in it. P.S. Do you have anything else to add to this list? Please add them in the comments below.